Washington, DC (April 2, 2007) — International aerospace and defense journalist Bill Sweetman, a highly regarded veteran who most recently served as aerospace and defense editor for the Jane’s Information Group, has joined the AVIATION WEEK as Editor-in-Chief of Defense Technology International (DTI) magazine, Publisher Gregory D. Hamilton announced today. DTI, a division of the McGraw-Hill Companies’AVIATION WEEK, is an integrated media business dedicated to covering the interplay of defense technology, funding, operations, programs and policies. It launched in September 2005 with DTI magazine as a bi-monthly supplement to Aviation Week & Space Technology. 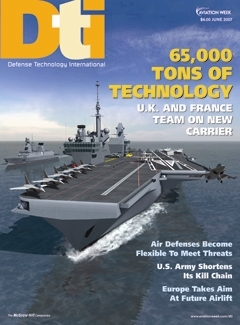 DTI quickly established itself with a worldwide circulation of 38,000 military, government and defense industry decision-makers, defense infrastructure opinion leaders and influencers, and this year began publishing as a monthly stand-alone magazine. In addition to the magazine, the DTI portfolio includes events and web-based products and services.